maintenance | Why you drive bad?! One of the systems that is most neglected in a car is the power steering system. Almost every car sold today has power steering and was designed to have power steering from the get-go. If the system ever failed, it is extremely difficult to maneuver the vehicle. Now some old-timers might go “we didn’t have power steering back in my day and we made due without it.” Cars from the olden days were designed without power steering so they had different gearing and bigger steering wheels to allow the driver to turn the car with ease. You really don’t want the power steering to fail because you probably won’t be able to turn the wheel without some help from a buddy. Luckily, it is extremely easy to do a fluid exchange without making a mess. All the cars I’ve performed this task on resulted in a quieter and easier to turn steering wheel (this is more true in Fords since they are notorious for loud and whiny power steering systems). 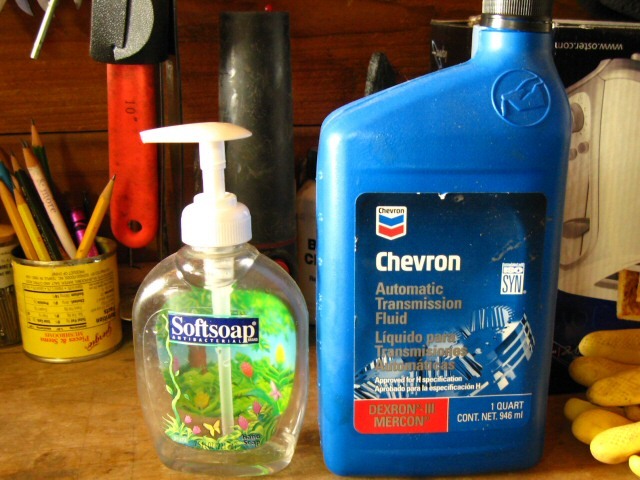 You will need a soap dispenser, an empty bottle to catch old fluid, and new fluid. Some manufacturers require special power steering fluid so check your manual to what type of fluid to use. 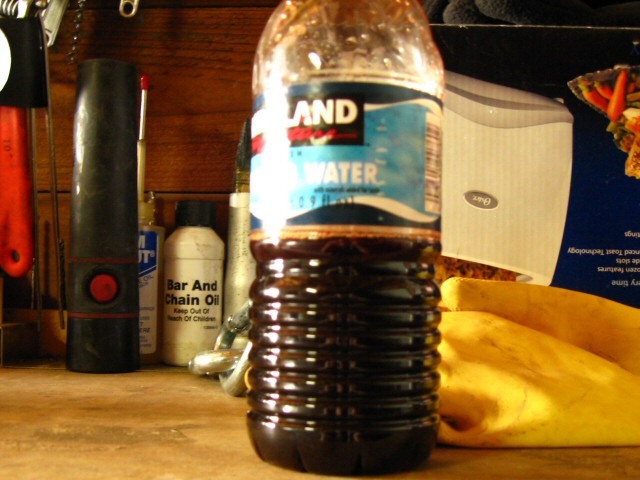 I always use transmission fluid in my cars (which is usually what the manual specs) because the red color allows me to see if the fluid is clean or dirty real easily. All you have to do is find the power steering reservoir under the hood. It is either going to be on the engine somewhere or mounted near the fender. Your owner’s manual will usually tell you where it is. Make sure the soap dispenser pump is cleaned out well with water first. You don’t want soap in the system. 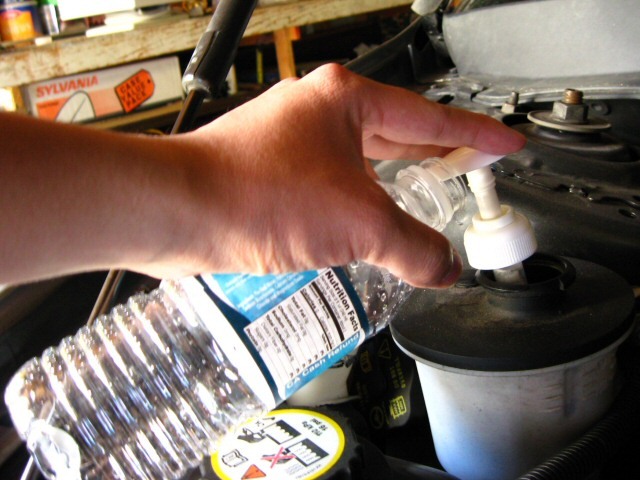 Then just stick the dispenser tube in the power steering reservoir and pump all the dirty fluid into the empty bottle (Gatorade or water bottles are the best for this because they’re clear). Try and get as much old fluid out of the reservoir as possible. The soap dispenser pump may not reach the bottom, but that’s okay. Once you pumped out as much as possible fill the reservoir with new fluid to the MAX line. Drive the car around for a week and make sure at some point you turn the wheel from one extreme to the other extreme to get the new fluid circulated. Now doing this once only gets half the fluid out of the power steering system. The theory is that you’ll drive around and let the new and old fluids mix. This will gently rinse all the parts. Just repeat the procedure once a week until the fluid stays red (or whatever color new fluid you put in). The second time you pump out the fluid, it will be just as dark as the first time, but it should start being less dirty after the third time. When you’re done doing the entire system, just take the old fluid to any auto parts store or your mechanic to dispose of it properly. The total cost of the new fluid and the soap dispenser is usually $10 to $15 compared to a flush at a shop costing over $60. Go ahead and do it already!